Lately I have been LIVING for dainty jewelry. I had to finally stop browing/ shopping for clothes because I realized there's no point in shopping when you're this pregnant and then I will have a post partum body for a while even after I have this babe. The worst thing you can do after having a baby is trying to jump back into your old clothes or go shopping! Your body feels even more foreign than being pregnant and NOTHING fits the same. It can be really discouraging but I have to remind myself that I always slim back down a bit and get comfortable in my own skin again. 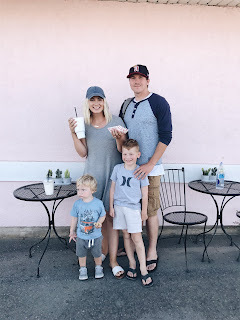 I have healthy and low expectations for this post partum bod so I have been loving getting some cute sandals and jewelry for summer time to accessorize and dress up my basic tee and jean outfit or basic t-shirt dress. I love wearing comfortable easy clothes in the summer so light-weight and simple jewlery is a MUST. Of course a post on my favorite jewelry would never be complete without MadeByMary my favorite necklaces for mamas and best place to get gifts! My absolute favorite pieces of jewelry right now and all UNDER $50! Ditching Jeans - Pants for Spring!